The development of mobile payment platforms, increasing options for providing debt, and cheaper and better off-grid solar power systems are presenting countries around the world with a chance to leapfrog the archaic electricity infrastructure that defined the twentieth century. Looking to take advantage of these powerful emerging trends, d.light, a startup founded by two Stanford Business School alums, has raised $22 million in its latest round of financing. The company was launched at the height of the first push by young entrepreneurs into renewables in the 2006-2007 timeframe. For d.light, inspiration for its initial product came from an accident that d.light’s co-founder Sam Goldman witnessed during his time working with the Peace Corps in Benin. Goldman witnessed an accident involving a neighbor’s child who accidentally knocked over a kerosene lamp, spilling the fuel on himself and suffering third degree burns across his body. Goldman had seen similar lamps all his life while moving from country to country as a child. When he returned to the states for business school, the idea of creating a low-cost, solar-powered replacement for the lamp became his focus. Business school was where he met Ned Tozun, who had similar dreams of changing the energy and power mix in emerging markets. From that first solar-powered lamp, d.light has expanded its product suite to include everything from a solar powered energy kit for an entire home and… soon… low-powered televisions. 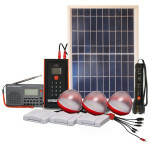 The evolution of the company’s business has come with an explosion of interest in off-grid power for emerging markets. Indeed, d.light’s success mirrors that of its one-time business partner, M-KOPA Solar in Africa. Both companies depend on the development of mobile money payment systems in Africa and both have used debt to bring their products to market. According to Tozun, d.light is able to sell their products more cheaply and in more markets, because their systems aren’t tied to a single telecom carrier the way that M-KOPA’s solar arrays are linked to Safaricom in Kenya. For d.light that was by design so the company could sell its array in several markets. At their core, both systems operate in the same way. M-KOPA and d.light both provide solar panels, converters, lights, cell phone chargers (and eventually other low-power appliances) through an installment payment plan that can be financed through direct loans from the company or through micro-financing from local lenders. By not using a single sim card interface, Tozun said that the company could expand to parts of Asia and Africa that are not as consolidated as markets in Kenya and Nigeria. Through its partnership with M-KOPA, Tozun said d.light has installed roughly 120,000 of its systems before M-KOPA cut its ties with the company and began manufacturing its own equipment. “One of the things that the business model provides that M-KOPA doesn’t is that it’s a fundamentally lower cost structure,” said Tozun. “We’re in the same places as M-KOPA we’re 20% cheaper,” he said. And while M-KOPA has been able to consolidate a position in Kenya with its home kits, Tozun argues that d.light has fostered more brand awareness and loyalty in other markets through the sale of its $5 basic solar-powered light (Goldman’s kerosene lamp replacement). Even the basic market for replacing kerosene lamps is huge. Roughly 2 billion people burn kerosene in lamps for light. At $5 per lamp, that’s big money for any vendor. The issue, said Tozun, is the flood of cheap products that have soured consumers on solar goods. Without quality controls, countries with large solar manufacturing capacity and lax product safety laws have flooded Africa with low cost, low quality products. Upselling quickly follows. “We’ve sold 2 million units into Kenya of the off-grid lights,” Tozun said. And that’s led to success with its power systems. The new $22 million in funding will help d.light build out a sales network for its “totally proprietary” technology platform, Tozun said. Led by KawiSafi Ventures and Energy Access Ventures, along with follow-on investments from NewQuest Capital Partners (which picked up DFJ Asia’s stake in d.light), and some impact investors, the new round will also help finance the commercial rollout of the company’s new low-power television sets. Big government money is pouring in from the West. For instance, there’s Power Africa, which was set up by the U.S. Agency for International Development. It’s a $43 billion public and private U.S. initiative to develop renewable power in sub-Saharan Africa. An entire solar power array, costs $25 down and 40 cents a day for a year. After that, the system belongs to its owners. Then, d.light tries to upsell the consumer with a second system or one of its new white good products (a TV to start, but soon, a fan or a fridge). According to him, the next target for the company are the billion people who have “unreliable” connections to the grid. “That’s the next market,” Tozun said.